Spread across three distinct campaign episodes, DUSK is a brutal retro-inspired shooter from David Szymanski and New Blood Interactive and it's now on Linux. Note: Key provided by publisher. DUSK might be one the biggest highlights of this year for me already, a shooter that is exactly how you would expect it to be with action that just doesn't stop with no useless padding. There is of course secrets to find, for those who like to chase that 100% but they're not required. What gets me about DUSK is the atmosphere, which is a lot thicker than I thought it would be. There has been multiple times it made me jump, as you don't really expect a lot of what's coming. There is a plot, which you can mostly ignore because the game really is about killing everything that stands in your way with various weapons. In addition to the blood-soaked campaign there's also an Endless Survival Mode as well as arena multiplayer to truly get that classic shooter fix. Simply calling DUSK a retro-inspired shooter doesn't really do it justice. Sure, it takes inspiration from the classics like Quake, Doom, Heretic and more but it's truly a finely crafted game. It completely blows a lot of current shooters out of the water in terms of overall fun. For those curious, I tested it on my low-end Intel notebook as well as my desktop and in both cases it worked beautifully. The Linux version really does run very nicely. Finally, it has a fantastic soundtrack with plenty of heavy drops that fits the mood perfectly, carefully created by Andrew Hulshult to really give it that authentic experience. 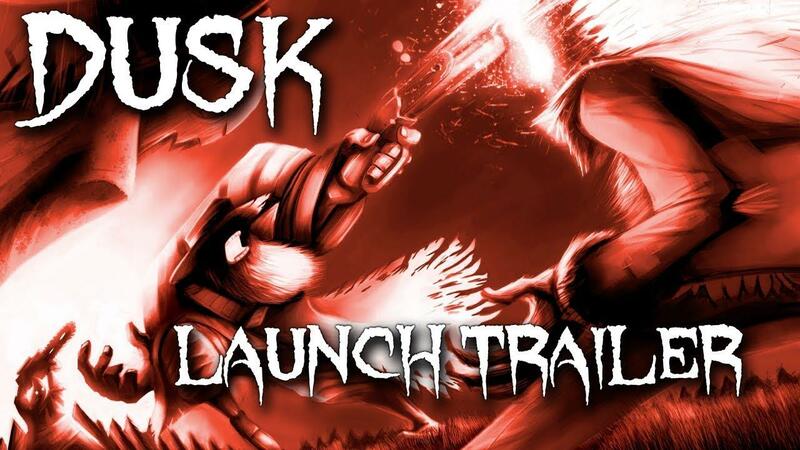 Find DUSK on Humble Store and Steam. I'll get this game eventually; they seem to have got everything right. ... also I'd like to see another joke gif: Tux-headed Arnold sees Windows-headed Predator for the first time, and says "you're one ugly motherf..."
Quote Finally, the time has come. Well, now I feel compeled to buy the game in order to increase the number to roughly 18. EDIT: WOW Dusk is super awesome! highly recommend, so fun and fast, and strafe jump! Nice, already had it on my wishlist, time to buy. Damn. Does not work with my 4500mhd laptop. Not really old school if it does not work with old hardware. Have to just play with my desktop then. At least Ion Maiden works with it. I wish that devs that do old school games would make sure that it works with old school hardware. Kind of feels dumb to have crappy graphics if there is no use for crappy graphics. Maybe it's better that i don't write a review in Steam. I bet it's a good game though. when it's on GOG, I'll buy it! I can't wait! Imnotarobot I wish that devs that do old school games would make sure that it works with old school hardware. Kind of feels dumb to have crappy graphics if there is no use for crappy graphics. The polygon count may be lower, but that's only one part of the equation; newer retro-inspired games make use of physics, # of interacting objects, lighting, etc., that require relatively powerful contemporary systems -- and are way beyond the capabilities of retro machines.